The Landing Ship Dock CARTER HALL honors the name of a Virginian estate steeped in American history. Colonial Nathan Burwell built his country mansion on 8,000 acres in the lower Shenandoah Valley. The estate is located near the present town of Winchester in Northern Virginia. The house took two years to build, 1790-1792. and Burwell named it after his great-grandfather, Robert "King" Carter. He chose a commanding site in a grove near a good spring. The clearing for the buildings left a fine body of oak and timber surrounding the estate, which still remains today. The panoramic view of the Blue Ridge Mountains and the Shenandoah River stills thrills visitors. The mansion was used alternately as headquarters for the Union and Confederate troops during the Civil War. The family silver and other valuables were hidden in a secret place between the roof and ceiling to escape theft. Burwell donated two acres of his land for a chapel where several notables are buried. Among those laid to rest there are Edmond Randolph, the first Attorney General of the United States and previously a governor of Virginia; novelist John Esten Cook and poet Phillip Pendleton Cooke. In 1929, Gerald Lambert bought the mansion and grounds from J. Townsend Burwell and completely modernized Carter Hall. The People-to-People Foundation, Inc., parent organization for Project Hope, acqured the property in 1977. Carter Hall is now headquarters of Project Hope's worldwide health sciences education and training program. The Shield: The colors of the field -- red, white, and blue -- stand for the United States. The saltire recalls the heritage of the South and the history of Carter Hall, Virginia. The anchor represents the Navy. The tines are in the form of pheons, symbolizing the mission to support assault operations. The loose rope intertwined with the anchor signifies freedom; the border rope denotes unity. Dark blue and gold are the colors traditionally associated with the Navy; red is for courage and white is for integrity. The Crest: The griffin denotes courage and vigilance. The crown refers to the heritage of the Carter Hall estate, recalling the great-grandfather of its builder. The battle stars of the first CARTER HALL (LSD 3) are commemorated by the arc of stars over the griffin. The six blue stars are for CARTER HALL's battle stars earned during World War II. 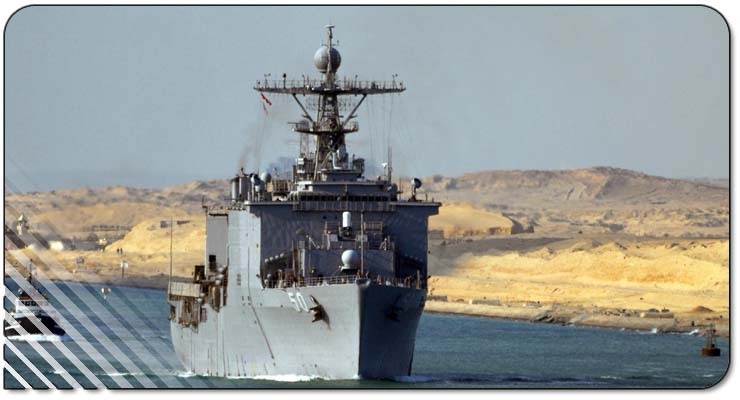 The five gold stars commemorate her service in Vietnam. The motto is underscored by the olive branch for peace and oak for war. Gold is for excellence; red is for courage. 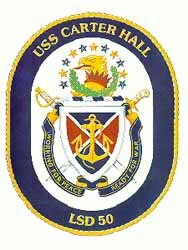 SEAL: The arms are emblazoned on a white oval enclosed by a blue collar edge on the outside with a gold rope and bearing the inscription "USS CARTER HALL" at the top and "LSD 50" at the bottom in gold. MOTTO: "Working for Peace, Ready for War."